The most common locations for installing insulation in a home are attics and exterior walls. However, to gain the maximum impact and energy savings from your insulation, it should also be installed in ceilings with unheated spaces above, overhangs, sun-rooms, basements and other specialty areas like garages. Cellulose insulation can also be installed in the interior walls between rooms in a home for increased sound proofing and greater fire safety. The diagram here shows the places that we recommend installing or adding Cellulose insulation in homes. 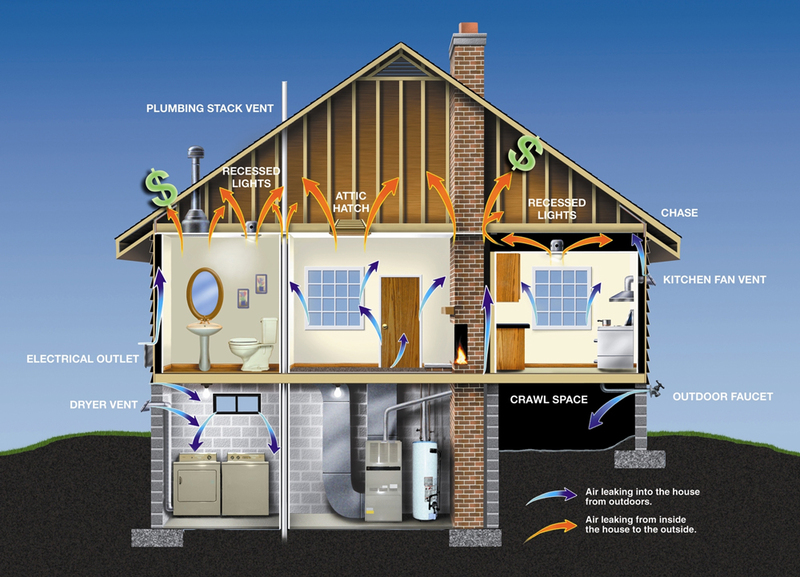 Cellulose Insulation helps stop air leaks shown in this graphic from energystar.gov. When building a new home, doing an addition, remodel or adding/upgrading insulation in an existing home, discuss the insulation in detail with your builder or contractor. Refer to this page and diagram to ensure your home is getting insulation installed in all the critical areas for maximum energy efficiency and improved living environment benefits.